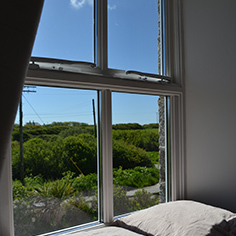 Bedroom one is a calm and quiet double room with easterly views directly over countryside and the famous Ruan Grade Church (St. Grada and Holy Cross). 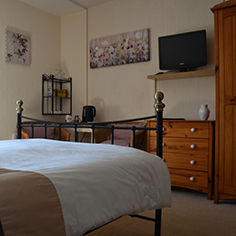 Traditionally furnished with double wrought iron bedstead, pine furniture and comfy wicker chairs. 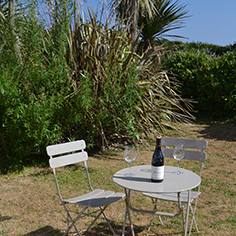 Rooms are available from 4 pm on day of arrival. All rooms are non-smoking. 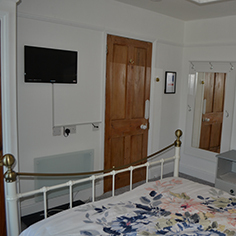 Each bedroom is fully carpeted, has easy access to both sides of the bed(s), with tea and coffee making facilities. 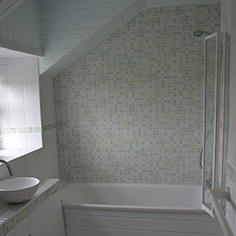 The en suites have powered showers and vinyl flooring. Towels are provided; in consideration for the environment, these are laundered every three days, although can be changed more frequently upon request. Rooms are cleaned daily at 11 am. There is full fire protection throughout; the fire alarm is tested outside of guest hours. 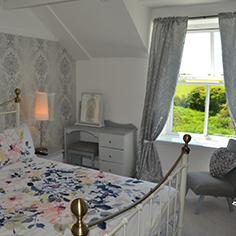 Bedroom two is a light and airy double room with lovely views over the front garden and fields. 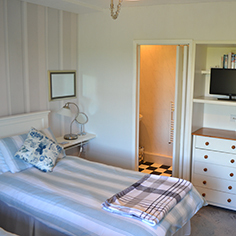 The room can be used as a twin or king size bed, with built in furniture and comfy wicker chairs. 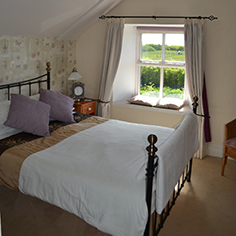 Bedroom three is a romantic king room with lovely views over the front garden and fields. 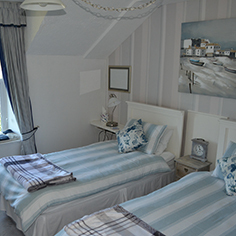 With classic style muted grey furnishings and comfy padded chair, this room feels like a true getaway. 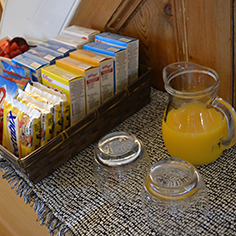 We offer you a warm welcome, and a great way to begin your day, a chyheira Breakfast - Served between 08:15 - 09:15 in the breakfast room. For those needing an early start, let us know and we'll do our best to accommodate. We serve Semi Skimmed or Soya Milk, and a natural yoghurt or Soya yoghurt according to preference, and we always havedecaffinated tea and coffee as an alternative to regular plusa selection of fruit teas. don't worry we also have good regularcoffee and tea full of caffine! 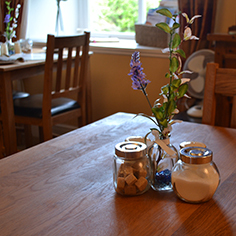 Our aim is to set you up for the day's walking, sight seeing or relaxing, the breakfast room is cosy and is a good place to curl up in a chair to read or do a crossword, and in the cooler months we'll light the wood burning stove, this room is available to you at anytime to relax in. A great start to the day - Fruit, Cereal, Yoghurt & Juice, or we can make you a bowl or creamy porridge, just ask. 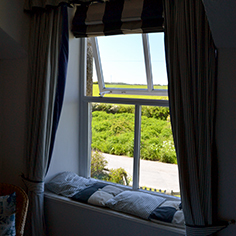 Followed by - Full Cornish Breakfast, locally sourced grilled bacon, sausage, hogs pudding, fresh tomatoes or baked beans, mushrooms & eggs cooked the way you like, poached, scrambled or fried. For those of you who would prefer to avoid meat, we offer vegetarian sausages or smoked haddock, and of course if you prefer to have a simple scrambled eggs on hot buttered toast that's fine. With notice we can offer a vegan breakfast, olive oil granola followed by bagel with mashed avocado. Followed by - toast with local honey, marmalade or nutella, Jam or peanut butter. freshly brewed Tea, Coffee, hot chocolate or fruit tea. 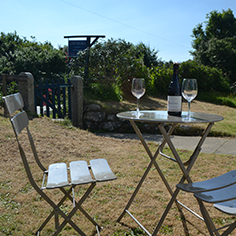 Although we do not supply evening meals at the moment, we can highly recommend either the Cadgwith Cove Inn, The Top House Inn, Smugglers Fish and Chip Shop in Lizard Village. OR Jumunjy who will deliver Thai Food, which is the very best Thai Food. 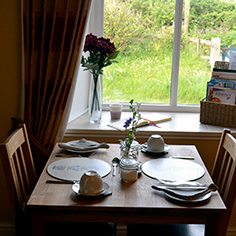 We are happy for any cooked food brought into the premises to be eaten in the breakfast room, where we will provide crokery and cutlery for you to use. We request cooked food is not consumed in the bedrooms, thank you.